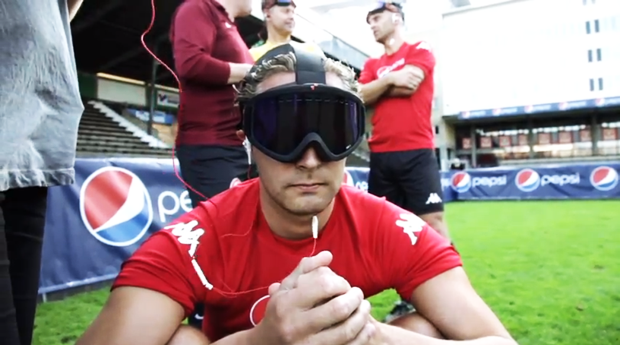 A Swedish campaign, part of the Pepsi Refresh Project, fits visually impaired soccer players with sense-enhancing technology that creators hope will have off-pitch applications. Pros vs. Joes is a relatively common sporting device–retired professional athletes square off against capable amateurs in a test of athletic skills. But what happens when the Joes in such a pairing also happen to be visually impaired? Swedish agency Åkestam Holst leveled that seemingly uneven playing field with the Pepsi-funded project, The Sound of Football. The Sound of Football paired one team of former football pros with another team made up of visually impaired players, and fitted them both with equipment that allowed them to hear, rather than see, what was happening on the playing field around them. The agency hopes that the technology developed for the project will help the visually impaired off the pitch too. The Sound of Football is part of the Pepsi Refresh project, a 2010 campaign created out of TBWA/Chiat/Day Los Angeles that encourages and funds innovative ideas. The campaign rolled out to more than 25 countries this year. To make this ambitious idea work, Society 46 used the same tracking technology that was used during the 2010 FIFA World Cup to position each player in real time on the football pitch. Sixteen cameras were placed across the pitch at Stockholm’s Söderstadion and captured data on the location of everyone on the field. Exact positions and geometrics were extracted and fed into an iPhone application that converted the data into binaural 3-D sound, which gives players a sense of distance. Through headphones each player can hear what’s happening around them: A bell rings as a player approaches the ball, a cymbal means they’re close to the net, and a thumping drone signals an incoming player. To position sounds within the 3-D environment, developers used FMOD–a programming library for the creation of interactive audio, used in games such as Guitar Hero and World of Warcraft. And player rotation detection was powered by the iPhone’s gyroscope and internal compass, making the entire sound landscape change. Come game time, this new, equalizing piece of kit was met with equal parts anxiety and anticipation. For the sighted, donning a blackout shield and relying largely on their sense of hearing for game play was disorienting. For the visually impaired, it offered a new way to orient themselves in a fast-paced situation. The final score in this tech-enabled mismatch? 1-1. The question is not rhetorical. If building the technology was the challenge, then finding new applications for it is the next step, and public submissions are welcome at the Sound of Football site. Discovery will also air a documentary on the project in the coming weeks.